The weather was good for the 5 of us that turned out for this event in Coatbridge, although the wind proved to be a little tricky at times. 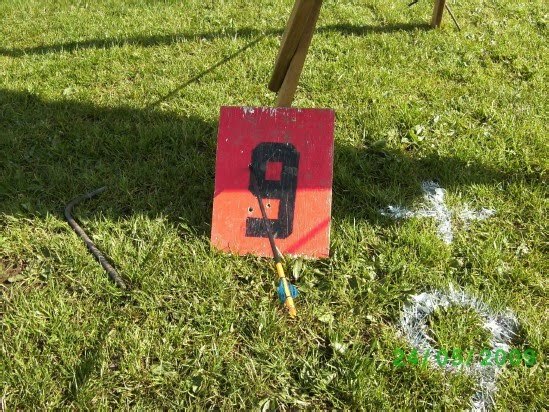 Brenda excelled herself as “Queen of the trick shot” by getting the number board with her first arrow, going between the bands on the right side of the target with her second arrow, and getting the leg with her third arrow ! Most people would think she’d struggle to better that, but after lunch, her target partner George B aged 10 yrs, when on release, the nock on Brenda’s arrow broke sending the arrow sideways and back into George B’s tripod, before bouncing off and hitting him. Lucky for George that the tripod was there ! After that it was suggested that maybe Brenda should get free entry to all shoots as the “entertainment” ! !